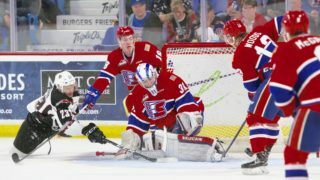 PORTLAND, Ore. — The Spokane Chiefs rallied back from an early 2-0 deficit to win in overtime, 5-4 in Game 3 of their best-of-seven first round playoff series against the Portland Winterhawks on Tuesday night. 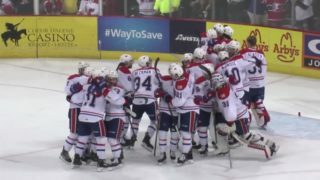 Riley Woods scored the game-winner just over nine minutes into the extra frame, pushing Spokane to a 2-1 series lead. 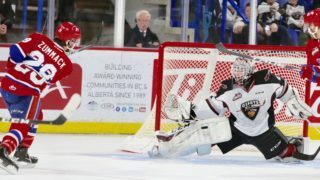 Portland was buzzing to start the game, scoring twice in the first seven minutes of regulation as Robbie Fromm-Delorme and WHL-leading scorer Joachim Blichfeld found the twine to give the Winterhawks an early edge. Spokane fought right back as Luke Toporowski capped a beautiful play to make it 2-1 Portland with 3:23 left in the opening period. Nolan Reid took a drop pass from Ty Smith to fire a shot toward Winterhawks netminder Joal Hofer. Eli Zummack corralled the loose puck and backhanded to Toporowski, who chipped it over Hofer’s right pad for his first of the postseason. 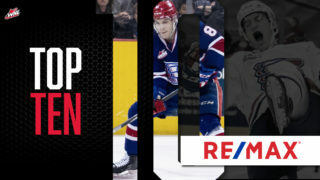 Overage forward Luc Smith tied the game up for Spokane 5:03 into the second period, blasting his second of the playoffs inside the left post on a power play to make it 2-2. Ethan McIndoe potted his second of the series just 39 seconds later off a perfect centering feed from rookie forward Jack Finley on a 2-on-1 opportunity. The Winterhawks clawed right back, earning some puck luck with hard-nosed play. Jared Freadrich scored to tie it at 3-3, shooting a puck that eventually deflected off a Spokane skate to beat goaltender Bailey Brkin. Following the second intermission, Fromm-Delorme scored his second of the night on a shot that deflected high into the air and over Brkin, sliding into the goal to make it 4-3 for Portland 1:44 into the third. 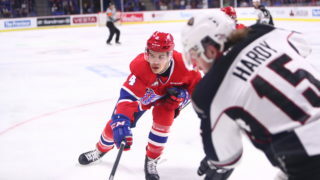 Finley responded in kind at 7:48, scoring his first career playoff goal with a point-blank shot created by a pass from Adam Beckman to make it 4-4, where it would remain through the end of regulation. 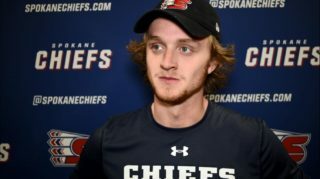 In a back-and-forth overtime frame, it was the Chiefs who secured the victory as San Jose Sharks prospect Jake McGrew forced a turnover in Portland’s end, bumped the puck to Beckman who then found Woods streaking down the middle. Woods held his man off and got a backhand shot away that beat Hofer to send the Chiefs’ bench onto the ice in celebration. Spokane outshot the Winterhawks 43-32 in another low-penalized contest. After zero penalties were called in Game 2 in Spokane on Saturday, just two were called on Tuesday. The Chiefs scored on their power play chance and held Portland 0-for-1. The Chiefs now lead in the series, 2-1. Game 4 will be Wednesday night in Portland.